I didn’t learn how to make shrimp scampi until I was in my early twenties. I just thought it was a delicacy you could only get at restaurants. I had no idea how easy it was to make at home! I’ve been making my Shrimp Scampi Pasta for years now, and as the years progress I keep finding ways to make it healthier. One of the ways I make my pasta healthier is buy using Dreamfields Pasta. Their healthy pasta recipe has fewer digestible carbs, about the same high fiber as whole wheat pasta, and it can help you manage your blood sugar. I’ve served this pasta to countless people and no one can tell the difference! Ove the years I’ve went from making Shrimp Scampi Pasta for only special occasions like Valentine’s day to entertaining with this main entree when all my family comes in town (about 15+). If you omit the broth and just use water for the cornstarch slurry (and of course omit the pasta) the shrimp scampi portion is gluten free! So it has always worked for me to make this dish when I entertain for my family since my cousin has a gluten allergy. I’ll dish hers up first (a nice hearty portion of shrimp is garlic-lemon wine sauce) and then continue to plate others on top of pasta. No need for me to have to make multiple meals to suit all needs. So if you haven’t thought about what you are doing for Valentine’s Day dinner tomorrow night you might want to consider this quick-and-easy Shrimp Scampi Pasta to impress the one you love! Oh and if you want to spice this up a little I’ve been known to add in a handful of chopped fresh spinach or even some grape tomatoes into the scampi sauce as it reduced down. Get creative! Looking for a quick and easy fancy dinner that will impress just about anyone? 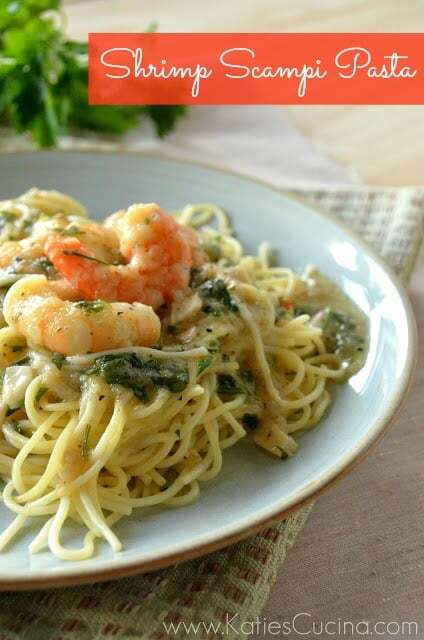 This Shrimp Scampi Pasta will not only impress the ones you love, but satisfy everyones craving for a rich shrimp scampi dish that is lighter on the waistline! Bring a pot of water to a boil (make sure you salt your water). Once the water comes to a boil put in the spaghetti. Cook until al dente (according to package). In a skillet, on medium heat add butter and olive oil cook until butter is melted (about 1 minute). Then add the lemon pepper seasoning, thinly sliced garlic, and red pepper flakes. Cover and let this marry for a few minutes (5 minutes) (make sure that the butter and garlic do not burn)! Add white wine to the pan and stir. Let the wine cook out of the dish (about 5 minutes) then add shrimp. Cover and cook on medium for 2-3 minutes. While shrimp is cooking mix together teaspoon chicken stock with 1 teaspoon cornstarch. Set to the side. Stir the shrimp, and then push them against the pan to create a hole. Turn the heat off on the stove burner. Whisk in cornstarch liquid mixture making sure that it doesn't get lumpy. Sprinkle half of the fresh parsley in the pan. Mix everything well. Remove the pan from the heat. Plate spaghetti and then generously dish out shrimp and sauce over pasta. Serve with a wedge of lemon and enjoy! *If you omit the pasta and the stock using water instead for the cornstarch slurry this can be served as a Gluten Free dish. Katie's Cucina Original Recipe Copyright 2013. Disclaimer: I have a working relationship with Dreamfields pasta. I received pasta to create this recipe; however, I was not compensated. As always all opinions are my own. oh yum, what a delicious meal! Super easy, and much lighter than the restaurant dish! I’ve never made shrimp scampi but this has inspired me to do so! Great photo, Katie! Shrimp Scampi is one of my favorite things in life! Yours looks lovely, and perfect for a special dinner. Pasta is so perfect for a crowd. I love making it when we have company! Shrimp Scampi being one of my favorites, get made a lot around here! Love the recipe! Angie I agree–perfect for entertaining! I loooove shrimp scampi. This looks perfect. My husband was just asking me to make shrimp scampi last week! Pinned to try soon! Jessica too funny! I hope you guys enjoy my “lighter” version! Shrimp scampi is one of my favorite foods! This looks delicious! 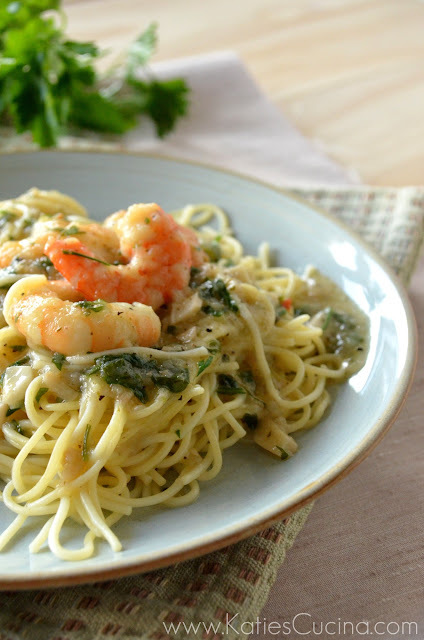 Shrimp scampi is so easy to make, but oh so tasty! I love using Dreamfields! Stephanie I agree on all three! Thanks for stopping by and leaving a comment! I’ve never made shrimp scampi at home either but your version sounds delicious and totally doable! Joanne–it is so easy to make! You must give it a try! Did I read this recipe correctly that it calls for 2 sticks of butter? Patricia–thanks for the catch! It was supposed to read 2 tablespoons of butter not sticks! I love shrimp scampi! It has two of my favorite ingredients – garlic and lemon. Must try this Dreamfield pasta. Yes! 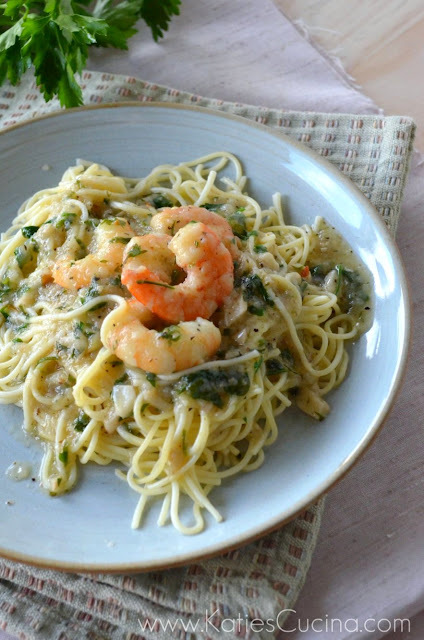 We love shrimp scampi in our house and I don’t feel as guilty when I use Dreamfields pasta!